Both play rehearsals and knitting continue to go swimmingly. We had our second run-through last night, and I got seven inches knit on the second sleeve of my TPCT. I'm hoping to get this finished tonight, so I can really go to town on the baby cardigan for my cousin this weekend. The Wizard of Oz is coming together so well-I'm immensely proud of my community and my company for doing such fantastic work, and I'm so excited to be a part of it. I hadn't really expected TPCT to last as rehearsal knitting through most of rehearsals, but it's definitely become a great tactile memory of these last five weeks. We're getting into the final stage of play rehearsals-I now have rehearsal every night, and will for the next two weeks and through production. I got quite a bit of knitting done this weekend-I started the second sections for both my Recharge KAL and my Windy City MKAL shawls, and I finished the body of my TPCT and have about half of the first sleeve done. I'm so much in love with my TPCT already. The body fits like a dream, and I have enough yarn to do a bit-more-than-elbow-length sleeves. I already have yarn for another of these, and I'm probably going to have to cast on for it right away! I feel kind of bad for stringing you all through this period of monotone blogging. I still have play rehearsals. I'm still knitting, though not as much as I would like. I don't have time to read, and my pile of library books is looking very intimidating. This is going to be my last free weekend until the play is done. Starting Sunday evening, I have rehearsals every night until production, and then the show will be completely over around 10pm on August 8. I'm continuing to take each day as it comes, and my TPCT and Finn should see me through production (but if not, I've got a few pairs of socks lying around). This weekend, the cinema downtown is having a free showing of The Wizard of Oz, and since I've seen the movie less than a dozen times, I'm hoping to see it. The cinema doesn't hold a ton of people though, so we'll see if I make it in. Otherwise, I hope to get through a couple of my library books at least, and finish writing the pattern for Finn so I don't have that hanging over my head during tech and production weeks. The late rehearsals are taking their toll on me-so far every day this week has felt like it should be Friday. I've been trying to counter the fatigue with cute outfits, and that helps, but I'm still just plain tired. I'm loving the rehearsals, and I'm grateful for the extra rehearsal time, and I really think the show's coming together well, but I do really wish that I could squeeze in another hour or two of sleep. There's just three weeks left until we're done-two more weeks of rehearsal, then production week, and then set breakdown, so I'm reminding myself to enjoy this stage of the process, because here's when it all starts to get really intense and overwhelming. It's also the point where everything goes so quickly, and I'm really having fun with this show and don't want it to be over in three weeks. Knitting continues to go as predicted-as you can see, I'm now several rounds into the bottom ribbing of my TPCT, and most of that has been done in five-minute bursts during water breaks, so I'm very pleased. As planned, I did bring Finn to the run through last night, although I don't have a photo because I didn't get home until after 10pm, and I made swell progress on that first sleeve. I'm still hoping to be able to get the pattern done this weekend, but I'm definitely putting catching up on sleep ahead of pattern writing. After the last couple of rough weekends, it was nice to have a great one this week. Saturday my mum and I drove into the city to run some errands-I had a gift card to Barnes & Noble that I wanted to use, and we putzed around a couple of thrift stores and got lunch. I made out really well at the bookstore-the Big Book was right there at the front of the store on the new paperbacks table. It took a while to find something to use up the rest of the gift card, but after wandering through all the comics and the entire SF/F section, I stumbled across the two Lovecraftian anthologies. Yesterday I had a six hour rehearsal for community theatre, and it went really well. It's going to be a long week in rehearsals-I've got four hour rehearsals tonight and tomorrow, and then another two hours Wednesday, and two and a half hours on Thursday. Tuesday we're running the show for the first time, so I'll hopefully get a lot of knitting done. I've made it to the bottom ribbing on my TPCT, and that will still be in my rehearsal bag all week, but I'm planning something else for Tuesday. I made spectacular progress on Finn this weekend, and she now has a finished body, a collar, button bands, and the start of one sleeve. I'm hoping to bang out the rest of that first sleeve on Tuesday, and then hopefully I can get the pattern finished next weekend and sent to my tech editor. Knitting this is pretty slow going right now, because every few rounds I just want to try it on! In some ways, I still feel like I'm catching up from the weekend, but if there's one thing that recovering from a day in ER is good for, it's getting knitting done! Check out Finn up there-the body is practically done. I have a few more rows of garter stitch, and boy, is it nice to be knitting something other than stockinette on that thing. The second part of the Recharge KAL pattern went out this weekend, but I still have almost half of the first section left. This is a real casual KAL though, and it's been great lunch knitting, so I'm not too worried about staying too far behind. That is, I wouldn't be too worried, if I didn't have another shawl KAL starting this week. 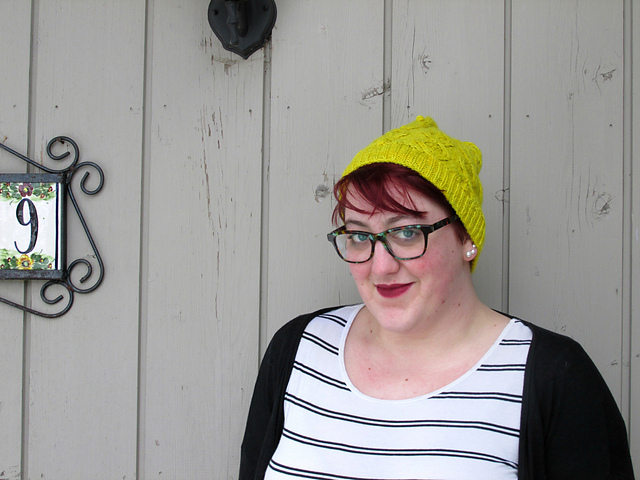 Allyson Dykhuizen's Windy City MKAL starts tomorrow, and I'm super excited! I'm using these two skeins that my friend Daria dyed-if they look familiar, that's because I picked them up at my knitting retreat in April. I'm super excited to have a plan for these skeins, and I'm really looking forward to knitting along with Allyson. Finally, (not really, I have like 40 more WIPs stashed around), one of my cousins is in the family way, and I'll be getting a new little baby cousin in a few months! So of course, I need to knit the little dude a sweater. I had this perfect ball of Opal in my stash, and I'm making the Garter Stitch Baby Kimono and it's just too cute to handle so far. As you all know (since I've been pretty much incapable of talking about anything else), the Tour de Cure ride was on Saturday. I want to thank you all again for your support so much. It meant a great deal to me while I was out on the course (and later, but let's not get away from ourselves). I was up bright and early to start the ride on time, and I actually was doing pretty well. I had a hiccup at the first rest stop that put me behind the other 50-mile cyclists, but I was determined to ride the whole way. It was hard-there were hills I needed to walk up, there was wind, my hands were tired, the roads had really bad spots-but I was determined to make a go of it, and I set a new personal record somewhere in the neighborhood of 30-something-ish miles. Yup. I didn't finish. I still got the fancy participation medal, which I've been wearing with pride, but somewhere after the 27-mile rest stop my insulin pump started giving me an alarm, and it turned out that I had a hardware error. Since my pump was broken, my blood sugar began to immediately spike and I had to go to the emergency room for the afternoon. I'm feeling much better now, and everyone at the Tour was really great about getting me off the course and getting me checked and following up after I got done at the hospital. So it didn't really go as planned. And I will admit to being a bit bummed that I didn't finish the ride. But there's always next year, and I still managed to raise several hundred dollars for diabetes research, education, and outreach, and I'm very proud of that. And I'm very proud I got as far as I did. The reality is, things happen that we can't plan for, and sometimes they put a pause on things, but I know I'll get another chance to ride the big 50 again next summer! I've been so busy this week with play rehearsals that I feel like I've pretty much run out of things to talk about here! I'm about halfway done the first section of my Recharge KAL shawl, which has been my lunch knitting this week, and I managed another two or three rounds on my TPCT during my (really short) rehearsal breaks, but otherwise I've had almost no knitting time since the weekend! We've had dance rehearsals until past nine in the evenings most of the week, and I've been trying to read after rehearsals to help get myself settled for bed. This week I've moved on to Ghost Signs for poetry, Blood Oranges for my novel (I read this when it first came out, but now I have the whole trilogy and want to start from the beginning), and Frida Kahlo: Retrospective as a wild card book. The Tour de Cure is tomorrow, so if you've been holding off from donating, this is your last chance! I haven't been on a proper ride since my accident last week, but I have my full range of motion back and my bike's in working order, so hopefully we should be all set. Worst case scenario, I get picked up by the sweep van and fed juice and orange slices. (That's a lie. The actual worst case scenario involves an ambulance and multiple medical professionals and missing several days of work, but I'm not thinking about that.) I'm cautiously optimistic that I'll be able to complete all 50 miles in about 4 hours, and Anemone will be waiting for me at the finish line so we can go get cheap Mexican food. Huzzah, a new top! I'm really excited for this one-I wanted a generous fit, and I ended up with about 12 inches of positive ease, and I love it. I'm a huge fan of big on top, tight on bottom, and I am feeling every inch of this baggy knit tee/pencil skirt combo right now. I knit this pretty much as written, but I skipped the last raglan decrease because I wanted a more generous neckline. I was hoping that this would use up all the rest of this yarn, but I still have most of a skein left. This was a super enjoyable, laid back, easy knit. I love the stripes, and I was always super motivated to get to the next one. Like I said, I'm thrilled with how this ended up, and I'll definitely be wearing it a lot with pencil skirts/skinny jeans/shorts. I have trouble wearing some of my knit garments because they feel too "nice," but this is super comfy and casual, so I should get a lot of wear out of it! Good news first: I am almost done with the back decreases on TPCT, and I've cast on for the first sleeve of my W+S Tee. It's a long weekend, so I might finally get the body of Finn done and be able to work on a new shawl design for a bit. The not-as-good news: I've gotten lots of knitting done because I crashed my bike on my way to work Wednesday morning and haven't been able to do much else. I'm fine, there wasn't a vehicle involved-I went off the curb and did a 3/4 somersault with my bike onto my left shoulder-my helmet did it's job and I'm mostly scraped up and bruised and sore. I sat out of dance practice Wednesday night, and while I was planning to get a few training rides in this weekend, I don't know when I'll be up for one. I hate that this happened so close to Tour, but I'm not pulling out. For now I'm just going to keep taking it easy and listening to my body, and we'll see if by Sunday or Monday I'm feeling up to a short ride.